Fancy a Japanese role-playing game (JRPG) featuring beloved Disney and Pixar characters and set in the world of movies like Frozen, Tangled and Toy Story? Kingdom Hearts 3 (KH3) is that and a whole lot more. Developed by Disney and Square Enix – the latter being the developer of the Final Fantasy franchise – KH3 is part of a long-running series that has its origins in 2002 in the first Kingdom Hearts game released on the PlayStation 2. The full Kingdom Hearts franchise spans various platforms including Nintendo and PlayStation. As a first timer playing Kingdom Hearts and missing out on 17 years of history, I find it quite an eye and mind opening experience. My review is based on playing KH3 on the PlayStation 4. 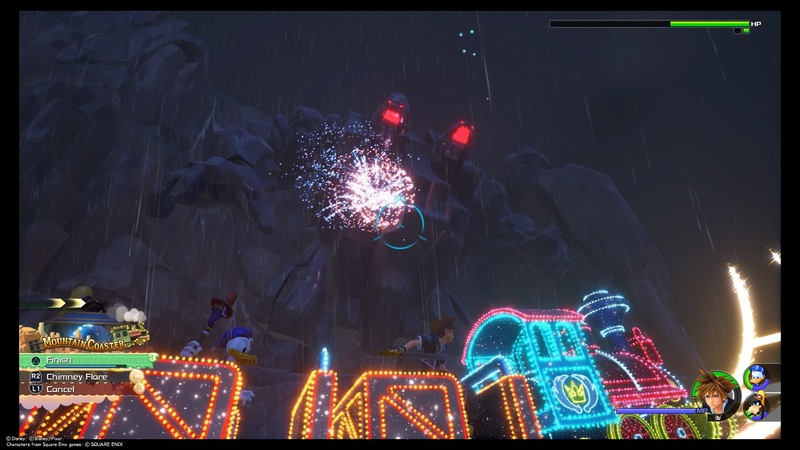 In a nutshell, KH3 is a whimsical hack-and-slash party RPG with a “theme park” feel. You can travel from one completely distinct world to another while meeting Disney and Pixar characters and have adventures with them, just like getting on different rides in the theme parks. In addition, the limit attacks, which are a mainstay of JRPGs, take the form of spectacular theme park rides. 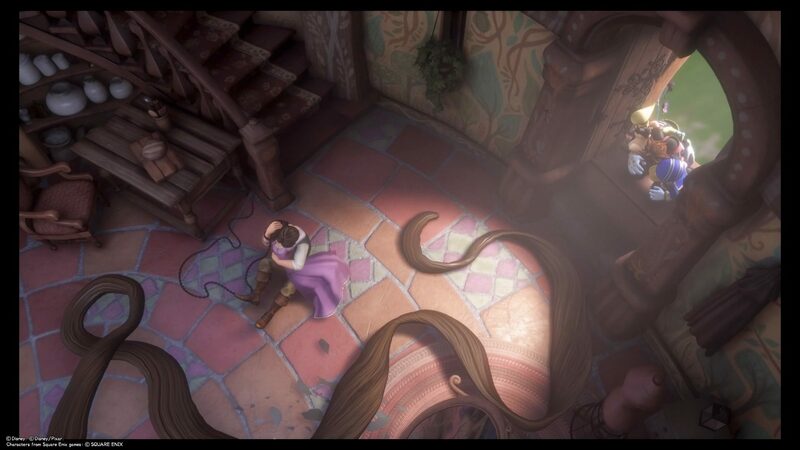 Immersive and beautifully designed Disney worlds like Rapunzel’s Kingdom of Corona in Tangled lets you enjoy the Disney movie all over again. Being a fan of Pixar and Disney films, KH3 gives me a chance to experience the movies more intimately. But not all worlds work out as well – some fill you with the wonders of exploration and the satisfaction of progress, but others make you feel that the game is forcing you to run back and forth in the same levels and encountering repetitive enemies. This can get monotonous fast. You play Sora, the main protagonist of the Kingdom Hearts series, who is a righteous teenage boy driven strongly by a sense of justice and love for his friends. Despite his good heart and noble intentions, he can be rather naive and simple. Fighting by his side are the easy-going Goofy as a knight and the grumpy Donald Duck as a sorcerer. The odd trio form the permanent party, while other featured characters may join the party temporarily in the world they are adventuring in, such as Woody and Buzz Lightyear in the Toy Story world. Apart from following the adventures of Sora, you also get to play Riku, who is together with Mickey Mouse (King Mickey, no less) in search of another friend. Beloved characters from Pixar and Disney movies can join your party and fight evil. KH3’s rather convoluted and hard-to-follow story comprises split dimensions, alternate personas, travelling between worlds (which is a handy plot device to introduce different Disney worlds and characters), as well as plenty of friends along the way, and just as many foes. Blame it on my unfamiliarity with the series, but I felt rather overwhelmed by the many characters from the previous Kingdom Hearts games who show up. I am constantly asking “Wait, who is this again?”. In KH3, you get to explore several different worlds based on Disney and Pixar movies, including Hercules, Tangled, Toy Story, Frozen, Big Hero 6 and Monsters, Inc., and take part in adventures together with the featured characters in these worlds. For instance, in the Kingdom of Corona, Rapunzel and Flynn Rider will be part of Sora’s party as they help Rapunzel escape from Mother Gothel and fight back the hordes of Heartless. 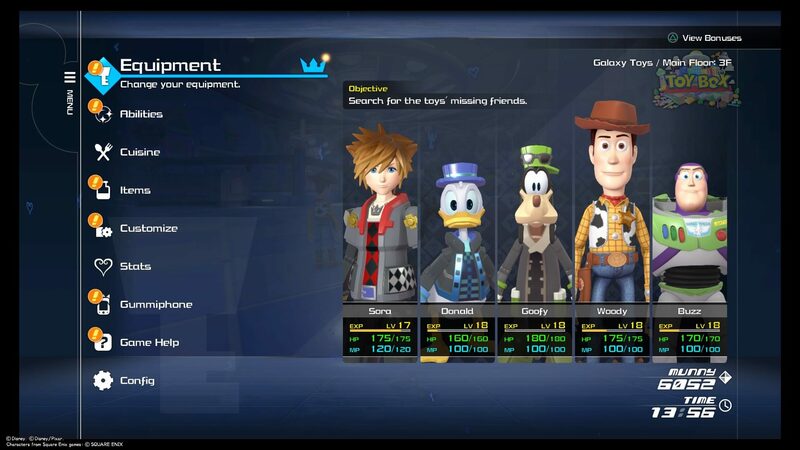 A nice touch is that Sora and his party look different to match the world they are in – they look like toys in Toy Story and monsters in Monsters, Inc.
Sora and his party travel between worlds by way of a fully customisable and upgradeable gummi rocket ship. 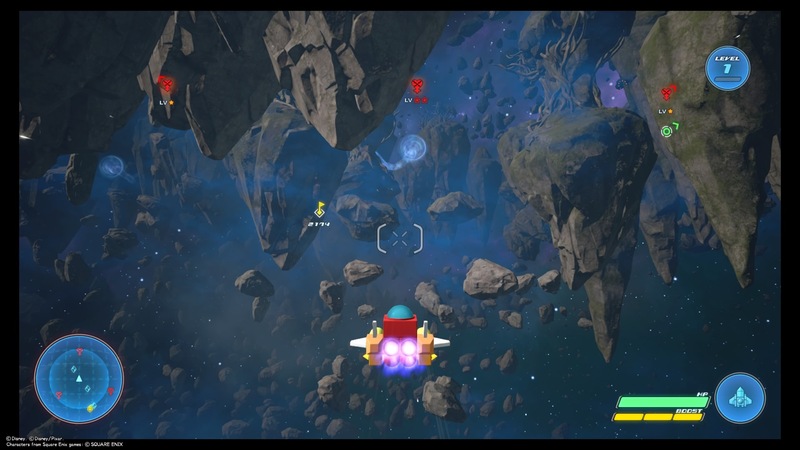 Initially, I didn’t bother to upgrade the ship and opted to evade but having a stronger ship will help in fighting off unfriendly forces that you might encounter in space. Although not being in a truly open world, since the levels are enclosed and keep you pretty much in a fixed path, you do have the ability to explore within the regions to look for hidden chests, ingredients and emblems. I feel that some of the levels are rather repetitive – you are often made to go back to the same places and fight the same adversaries again because someone went back for some reason or someone else needs rescuing. I do appreciate the thought that has been put into making the plot less contrived and trying to explain why Sora and his party needs to be involved. For example, the long running theme in Toy Story about what makes some toys sentient and not others is also explored and tied to the theme in Kingdom Hearts, which is about Nobodies – beings without hearts – and those with hearts. Even though this makes the story rather complex, it is a truly commendable effort on the writers’ part. Being spread over so many worlds, the game can feel too ambitious in its scope, and I often need to take a break in between travelling from one world to another just to go back to Twilight Town. 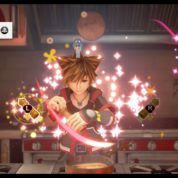 This could be to cook up a new recipe, complete some side quests and goof around for a bit with the multitude of mini games in KH3. There’s a lot to do. 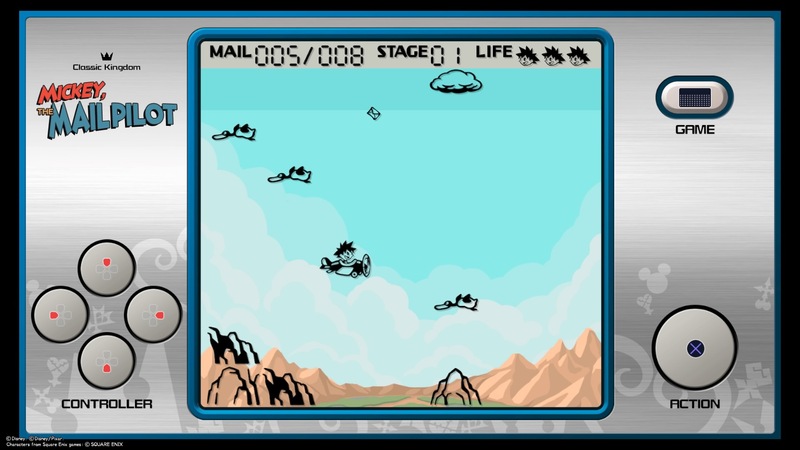 One such distraction is the series of Classic Kingdom retro games that can be picked up from the various worlds you explore, and can accessed anytime on Sora’s gummiphone. With simple directional controls, they are conceptually easy to play but gets increasingly more challenging as the game speeds up at the higher levels. Despite their simplicity, the games are quite addictive – I spent way too much time trying them out and attempting to beat my previous scores. Apart from dancing in Corona and cooking in Twilight Town, there are also quests that require you to collect items across the various worlds that you will be exploring. These include photo missions from Moogle Shops where you need to snap photos of certain creatures or landmarks, find ingredients to concoct new dishes in Ratatouille’s restaurant in Twilight Town. 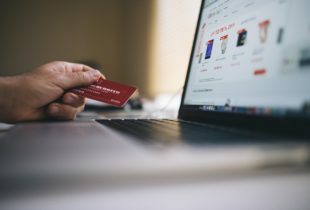 You will also take photos of lucky emblems in the form of the trademark Mickey Mouse shape cleverly hidden in the various worlds that you explore. These mini games will surely satisfy completists who love a challenge, as they are really not easy to complete! Despite not being familiar with the series, I found the game easy to get into since it is essentially a hack and slash action game where you control one character at a time. Your team members will launch their own attacks and sometimes help to heal you. Likewise, you might need to cast spells or use items to increase their stats, revive or heal them when they have been hurt. Like Final Fantasy XV, which is also developed by Square Enix, you can also prepare meals in that can boost your party’s stats when eaten. 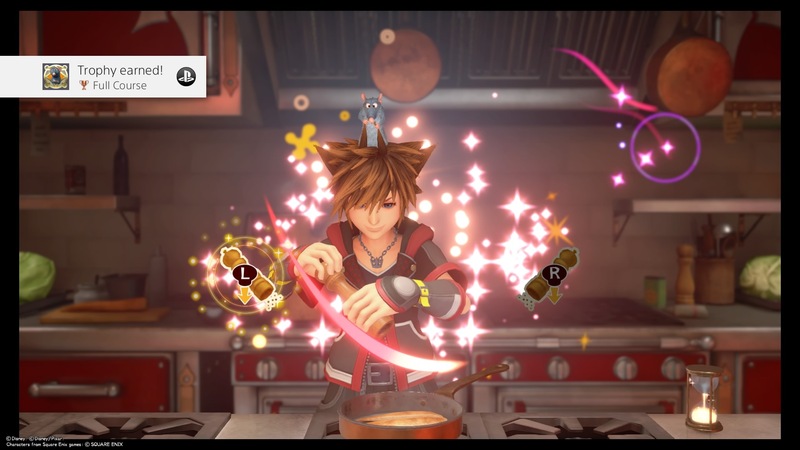 Cooking involves finding ingredients and going to Ratatouille’s kitchen where you play a mini game of coordinating actions at the correct timings to create a potent dish for boosting stats, which the party can eat before a hard battle. Combat in KH3 is well varied and fun, not just melee attacks all the way. Sora is the wielder of a weapon known as the Keyblade that looks like a big key that he uses to whack enemies. Different Keyblades also allow for different Form Changes, which will also change the types of attacks that Sora can unleash. As he travels to various worlds and completes missions, Sora will find new Keyblades that he can choose to equip. Apart from whacking enemies with melee attacks and chained combos, Sora can also cast elemental spells like fire, ice, lightning, water and wind. And once Sora hits the limit in battle, he can execute special attacks that are truly out of this world. 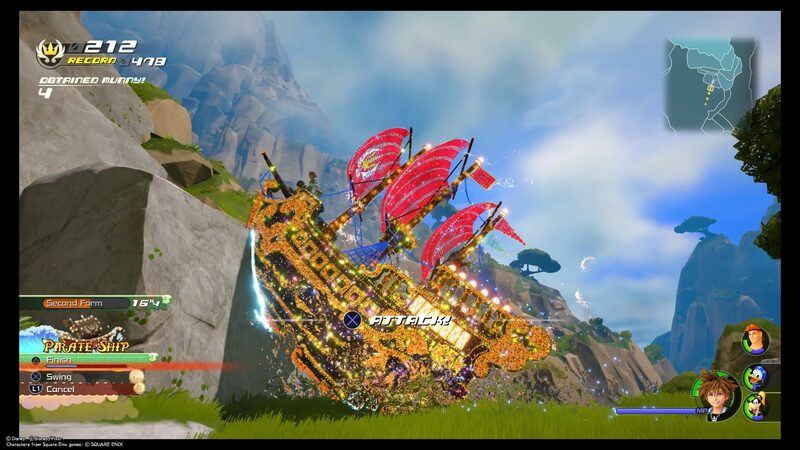 Inspired by Disneyland rides such as the Pirate Ship, Teacups and Carousel, these elaborate and whimsical special attacks are spectacular but difficult to use. Sometimes it’s because the camera is facing Sora, or is launched at a place devoid of enemies, or the ride takes up the entire screen so there isn’t much aiming to be done. Most times I will be charging around wildly and blindly pressing the “X” button without knowing if I’m hitting anything. 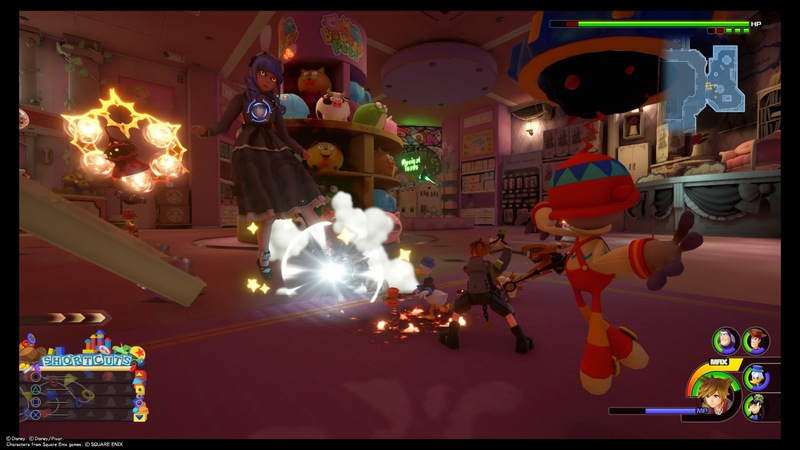 Sora can launch his own special attacks or partner with team members Goofy and Donald as well as featured characters in the various worlds to execute these attacks that unleash massive damage on the enemies. For instance, in the Kingdom of Corona, the party can be spun around using Rapunzel’s long hair to knock enemies back. The party can also find new gear that can improve their stats, namely Strength and Magic, when equipped. There are also items that can be used in battles to restore health and magic levels, as well as provide a boost for battles. In addition, certain items like shards, crystals and stones which can be dropped by enemies or hidden in breakable containers can be used to synthesise armour and weapons, which is great fun for gamers who enjoy scavenging and crafting. The main enemies that you encounter are the hordes of Heartless, led by Xehanort, who is seeking to bring darkness into the world. There are also huge battles with villains from the Disney universe like Mother Gothel from Tangled, Titans from Olympus as well as the Toy King from Toy Box, as well as those from Organisation XIII unique to the Kingdom Hearts series. Only Disney has the intellectual property clout to pull something like this off, but for fans who love Disney and Pixar movies, this is a real treat. KH3 is a great game for the young ones, with wholesome themes that focus on friendship, standing up against evil and always being willing to help those in trouble. However, I am not sure how well they can relate to classic Disney characters like Mickey Mouse, Donald Duck and Goofy, but fortunately the side characters from more recent films like Frozen, Big Hero 6 and Tangled will appeal more to the young ones. KH3 promises loads of fun for the young and the young at heart, for gamers who love games across all genres and fans of Disney movies and characters. Surely all of us will fall into one of these categories. However, the inconsistent levels, the uncontrollable limit attacks and occasionally repetitive gameplay mars an otherwise enjoyable experience. Kingdom Hearts III retails at SGD74.90.